I love this story which I picked up this morning through the Globe & Mail, about a man named Sohaib Athar, a resident of Abbottabad, Pakistan, who inadvertently tweeted the raid on Osama Bin Laden’s compound as it unfolded. What follows are the exact words of the article, with a few sentences omitted for brevity. It all leads to an amazing last sentence. We’re all one big human race, that sentence tells us. As the operation to kill Osama Bin Laden unfolded, Mr. Athar “liveblogged” what he was hearing in real time, describing windows rattling as bombs exploded. He questioned whose helicopters might be flying overhead. “The few people online at this time of the night are saying one of the copters was not Pakistani,” he tweeted. Mr. Athar then said one of the aircraft appeared to have been shot down. Two more helicopters rushed in, he reported.. Throughout the battle, he related the rumours swirling through town: it was a training accident. Somebody was killed.. The aircraft might be a drone. The army was conducting door-to-door searches in the surrounding area. The sound of an airplane could be heard overhead. Mr. Athar did not respond to media requests for comment — he explained in another tweet that a filter he set up to stop his email box from flooding could be culling out requests for interviews. Soon, however, the rumbling of international events far beyond the confines of this quiet upscale suburb began to dawn on Mr. Athar, and he realized what he might be witnessing. “I think the helicopter crash in Abbottabad, Pakistan and the President Obama breaking news address are connected,” he tweeted. The Frye Festival, at least for organizers, always has a sense of let-down when it’s over, like postpartum depression I suppose. We wish it didn’t have to end and we didn’t have to return to the real world. This year, with the election and Bin Laden’s death all happening the day after the festival, there’s even more a sense that what we’ve created is slipping fast into memory. Maybe, though, at the end of the day it will not be a down feeling, but joy as the results come in. We can always hope, prematurely or not. As we fully expected, the festival ended with a bang, with Margaret Atwood’s lecture Saturday evening, followed by a Q & A Session that lasted 40 minutes, instead of the allotted 20. The Capitol Theatre was filled to capacity, a little worried because she was AWOL until the last moment, returning from a trip to Sackville, where her grandmother had attended university. Her talk was entitled “Mythology and Me: The Late 1950s at Victoria College.” She was thoroughly entertaining (local CBC reporter Bob Mersereau blogged her as the best stand-up comic he’s seen in a long time) and richly informative about her own life, her years at U of T, her interactions with Frye as well as McLuhan, and her reading of Frye’s Anatomy, Educated Imagination, and Great Code. She read a long and irreverent piece she had written under the nom de plume ‘Shakesbeat Latweed’ while at Victoria College, making fun of the ideas of both Frye and McLuhan. She analyzed the ‘poetry’ of advertising spots for Coke, Pepsi, and other products of the 40s and 50s, making the (tongue in cheek) case that in the days when everyone was lamenting the aridity of the Canadian literary scene, here, right under our noses, a great oral tradition, calling for its own horde of specialists, was unfolding via the new media, radio and television. There was much on myth, not meaning true or false, as she tried continuously to emphasize, but story, and her presentation of the Great Code in a nutshell was a tour de force. As Rhonda Whittaker, host and interviewer, said afterward, “I think everyone was surprised by how wry and witty she was.” Even when we were not surprised we laughed a lot. After the talk and after the Q & A, she sat at a table on stage and signed books, generously greeting everyone in a long line of at least 250 people. The talk, by the way, should be available as an e-book sometime in the fall. Saturday was jam-packed with other activities, many of them focused on children, including Kidsfest in the morning, which attracted several hundred kids and parents. There were writing workshops for kids and an event called ‘Budding Writers’ where students in grade 5 to 8 read their own works. A Brunch & Books event with Fereshteh Molavi, Melvin Gallant, Shandi Mitchell, and Hélène Vachon was a quiet oasis for lovers of the written word. The final event of the festival, called Frye Jam, brought together 7 authors, French and English, as well as several musical guests, for a late night celebration of words and music. A tough crowd sometimes, for the authors, with some people doing more talking than listening, but Mark Anthony Jarman found an answer when he pulled his harmonica out of his pocket toward the end of his reading and fronted our favourite local band, Les Païens. And with skill, as his CV had forewarned us. This entry was posted in Frye Festival on May 2, 2011 by Ed Lemond. 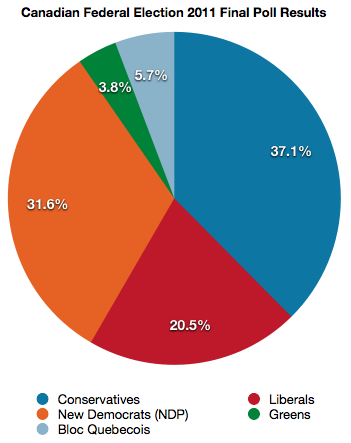 Almost 63% of Canadians are set to vote against the Conservatives. Here’s hoping we get a parliament representative of that. Vote. If you are not registered, you can still go to your local polling station and vote if you produce ID and a piece of mail with your address on it. This entry was posted in Canada, Current Events, Politics on May 2, 2011 by Michael Happy. There seems to have been an unprecedented reversion to those principles in this election, leaving the NPD at the very least poised to form the Official Opposition. It’s become apparent in the last week that there has been a significant shift from the centre left to the hard left among a significant number of Canadians as the NDP goes into election day with support as high as 35% nationally. At the same time, there’s been an equally unprecedented collapse for the Liberals, who have fallen to 20% nationally as a result of years of vicious and unrelenting smear campaigns against its leadership. The biggest and most surprising of these unexpected developments is the NDP lead in Quebec, where it has traditionally only been a marginal presence. This makes sense: if Quebecois voters are looking for an alternative to the Bloc and the Liberals are no longer an option, that leaves the NDP, whose policies are a good fit for the hard line support of social programs in that province. Just about everything about the Conservatives is disdainful — inheriting a massive budget surplus from the Liberals, which they quickly squandered with record deficits and compounded by commitments to still more corporate tax reductions, as well as tens of billions of dollars earmarked for jet fighters we don’t need, and for the construction of jails despite our diminishing crime rate. And that does not take into account Conservative corruption at all levels, including two findings of contempt of parliament, and the criminality that surrounds the PMO, which includes the possibility of jail time for two Conservative Senators and two more senior Conservative operatives for breaking federal election law. Here’s your Conservative Party legacy, 2011: criminal corruption, massive debt, contempt, jets, jails. However, if the vote on the left is split in enough closely-contested ridings, the Conservatives might still eke out enough votes to sneak past with a marginal majority. Even in this unfortunate event, more than 60% of the population will have voted against Harper and everything he stands for. Sadly, our first past the post system may accomplish that for him. It could conceivably occur even if Harper goes into this election with less support than he had in the last one. In other words, this is still something of a crap shoot. It may be we have never seen an election so volatile or an electorate so clearly scrambling to find the best means to deny Harper his majority. We already know what he’s got in store for us if he gets it. So our best hope is what some are calling the “Orange Crush”: the NDP breaking decisively into opposition status and confronting a vulnerable Conservative minority whose days are numbered. That could effectively end Harper’s career: the Big Brother and Maximum Leader portion of it anyway. So let’s hope for that Orange Crush breakthrough, and the right distribution of votes to break for the left where it is most needed. A sign a desperation: Harper yesterday pleaded with Liberals to vote Conservative to stop the NDP juggernaut. Given the ugly things he’s said about Liberals, calling them, among other things, “sheeple” and “Lieberals” over the years, not to mention the open contempt he displays for liberal principles at all times, that may not happen to any significant extent. The polling shows that a majority of Liberals fear a Harper majority, for obvious reasons. It may be that enough of them will not find it in themselves to cast a Conservative vote. But we’ll see. The decisive battleground will likely be Ontario. And the Conservatives themselves seem not to believe, based upon their own internal polling, that they can pick up the seats they need there to offset expected losses in Quebec and British Columbia. However it turns out, it will be an historic day: either a day in which the majority of Canadians prevail with a massive shift in support for the NDP, or a day they do not and the Conservatives win a slim majority with which they can impose an agenda most Canadians do not support. So let’s keep that in mind as we set out to vote today while encouraging everyone around us to do the same. This entry was posted in Canada, Politics on May 2, 2011 by Michael Happy.